Hands-Free Binoculars You Wear Like Sunglasses! The naked eye can only see so much, get a closer look with Zoomies! 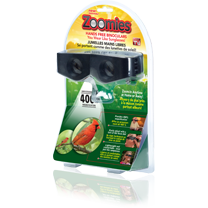 Zoomies are compact, hands-free, high power binoculars you wear like sunglasses and fold away for easy storage. Comfortable to wear and lightweight! Zoom dials on each side allow you to zoom in to 400% magnification! Great for indoor activity use as well as outdoor activities with the built in sunshade feature.